Stirlands and Chichester Priory Park continued their fine seasons with wins that boosted their promotion hopes. On a beautiful day in Birdham, Stirlands beat fourth-placed Seaford to secure another win in their quest for promotion. Visiting captain Oliver Smith won the toss and chose to bat on what appeared to be another batting paradise. But it was a decision that backfired spectacularly, as the opening bowlers for Stirlands, Ajinkya Deshpande and Dan Mugford, each took a wicket in their first over. Desphande had the dangerous-looking Thomas Date caught off the fifth ball of the game, and Mugford trapped the second opener with his first ball. Both bowlers took apart the visiting batting line-up with surgical precision, reducing Seaford to 21 for six. After some consolation by Seaford’s overseas player Akeem Ifill, who batted well with under-17 Zak Hearsey, Seaford reached 79 before Deshpande took his sixth wicket of the innings for 37, taking his total for the season to 51 league wickets in only 11 matches. Seaford started their defence strongly; taking three early wickets to remove the top three home batsmen and bringing in the experienced pair of captain George Coles and Torquil Deacon. A rebuilding job was in order and these two used all their experience, seeing off the dangerous Hearsey and punishing any wayward bowling, slowly knocking off the runs required. After 23 overs, captain Coles was able to seal victory with a towering six over mid-wicket to secure all 30 points for another well-earned team victory and push his side further towards potential promotion. Next up is a trip to third-placed Rottingdean – the prize probable promotion for the victors. Chichester Priory Park reckon they can earn promotion by winning their last four games - and began the sequence as they mean to go on at Mayfield. The hosts won the toss and under heavy cloud elected to bowl first. Chichester gave a first XI debut to opener Will Futcher and he and Peter Lamb made a cautious start. Futcher’s innings ended on 13 but Lamb continued to build a promising score. But Chichester’s batting again cracked under pressure as four wickets, including Lamb for 48, fell in a handful of overs. At 72 for 5, things looked precarious for the visitors. Stability came from George Stephens and Ezaz who righted the ship and steered towards calmer waters. The pair rebuilt and got under the skin of the bowlers. They feasted on anything loose, especially Ezaz, who struck the ball to all corners, including a massive six that struck the roof of the pavilion. Stephens fell for 29 and Ezaz soon followed for a run-a-ball 46 but their 79-run partnership had done the damage. The lower order didn’t contribute much but Chichester were content with a final total of 175. 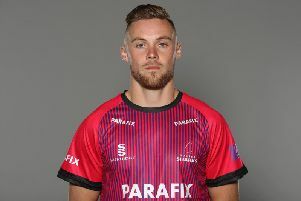 In Mayfield’s reply, three early wickets had the hosts struggling at 49 for three but a burst from Dan Cooke threatened to take the game away from Chichester. He reached a quick 36 before Sam Harvey struck, getting Cooke caught on the boundary going for one big shot too many. Steve Joyce got a lifeline, bowled off a no-ball by Matt Geffen, but fell soon afterwards for 39 to leave Mayfield 99 for five. Rob Sharma and James Allen threatened to tip the match back into the hosts’ favour and entering the final ten overs, Mayfield needed a very manageable 56 runs to win. Chichester captain Johnny Heaven removed Sharma via a stumping. Two overs later, Dan Joseph returned to clean-bowl Allen. Mayfield’s focus had suddenly shifted from attack to defence in the final five overs but they couldn’t cling on. Geffen dismissed Ed Finch for a golden duck and in his next over trapped Nick Manser lbw as Mayfield were bowled out for 157, giving Chichester an 18-run victory. Chichester moved up to third, 27 points away from the final promotion spot. Chichester still need to win all their final matches and face two huge fixtures at Priory Park in the next two weeks – the first against fifth-placed Haywards Heath on Saturday.